Orthotics are used in podiatry to support your feet. They are specialised shoe insoles or inserts, used for a variety of conditions and to reduce discomfort or improve positioning, alignment or weight distribution. At The Foot Clinic, we may prescribe or recommend orthotics to help you get rid of persistent toe pain, ankle pain, leg pain or following a bio-mechanical assessment. Depending on your diagnosis and your needs, we may also recommend postural and balance strengthening without orthotics. If your treatment plan includes orthotics, we will start with a clear diagnosis. Once we fully understand your situation, we will look at ways to optimise the support for your feet, to reduce pain, discomfort, swelling or other systems. The goal is always to improve the alignment and the position of your feet when you sit, stand, walk or run. The orthotics will change the way your muscles and tendons in your leg feel. After you start using your orthotics, you may need to talk to the podiatrist several times, so we can adjust them, and help address any discomfort if needed. Skin and Nail problems are common conditions that we treat. Problems such as bunions, corns and calluses, plus more are conditions that we can assist you with. Naboso Proprioceptive Insoles are textured insoles which improve proprioceptive and neuromuscular stimulation to the skin of the feet. The orthotic solutions will add more comfort, and more appropriate offloading. Our bio-mechanical assessment will help us understand your gait, and any misalignments that might cause other problems if left untreated. With customised orthotics, we can adjust the support, using a custom insole along the bottom of your foot. 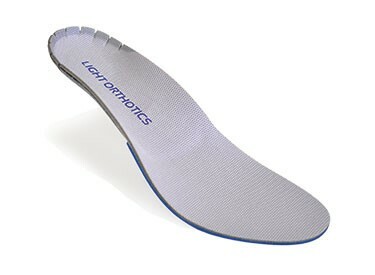 At The Foot Clinic, we prefer using ProTech Light Orthotics™ for the accuracy and a fast custom-fit. To create a custom-fit insole, we will ask you to sit in a chair on your bare feet. We will align a custom insole along the bottom of your foot, and ask you to press your foot onto a stretchy surface. This happens while your podiatrist holds your foot, ankle and leg at a correct and healthy angle. We now have an impression of your healthy foot position, on the customised insole. Next, we use ultraviolet light to harden the insole. The process is repeated for your other foot and then we are ready to fit the new, custom insoles into your shoes. You can walk in them straight away. If your feet require greater customisability, we use the latest in 3D scanning technology, to map the contours of your foot. The information is combined with the information from your bio-mechanical assessment. It helps us prescribe customised orthoses, which fit your foot perfectly. The prescription and all information is sent to our local orthotic manufacturer in Perth, and within 2 weeks your custom orthoses are ready. It is a good idea to bring a few pairs of shoes that you generally wear to this consult so that we can ensure that your orthotics fit well. Your podiatrist often adds strengthening and stretching exercises to your treatment plan. These routines are to correct overdeveloped and weak muscles that developed before you had the orthotics. Why choose The Foot Clinic? At The Foot Clinic, your podiatrist team has built a particular expertise in the bio-mechanics of the human body. We use this expertise to give you a full understanding of your gait, and to improve it so you can avoid discomfort and pain. 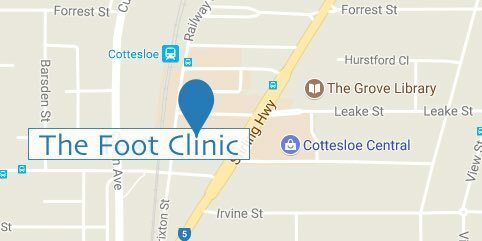 If you feel you could benefit from an assessment, or get help with the choice of your orthotics, please contact our clinic at Cottesloe Central.